Sam Bartlot is a young man who, until two years ago, zipped around is a souped-up car with blind optimism and a supreme disregard for municipal traffic regulations. "Speed," he often said, "ain't got nothing to do with accidents. It's them crumbs crawling around in second gear." Sam's outlook was as bright as his grammar was dull. He kept a color photo of his girlfriend's legs pasted on the rear view mirror, and a large plastic replica of the Virgin Mary on top of the dashboard. 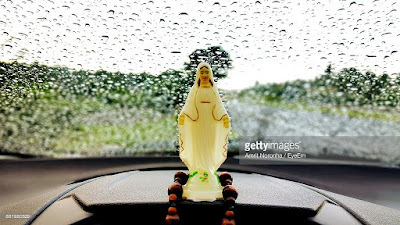 The statuette contributed a certain amount of theological comfort to Sam's occasional passenger, but blocked, unfortunately, most of the view through the windshield. Residents, it is rumored, called their dogs in off the street when Sam was thought to be in the vicinity, and four policemen knew the number on Sam's driver's license from memory. Sam was driving home one rainy night at a comfortable seventy-five when his right front tire blew a hole the size of a teacup. The car smeared a concrete bridge abutment and most of Sam went through the windshield. An ambulance crew scraped up the parts of Sam that were lying on the road, and the next day a garage mechanic cleaned out the rest of him with a high pressure steam hose before the insurance company wrote off the car. They packed Sam into the hospital with most of him leaking onto the floor and called for the head doctor. The doctor was playing bridge at home he arrived grumbling. When he saw Sam he stopped grumbling. A team of surgeons worked all night, and the next morning Sam was still alive with some parts missing and enough thread in him to sew up a circus tent. A very long time after he hobbled home on two canes and a shiny aluminum leg. Sam's nerves were bad for a long time. His health was even worse. His doctor was a progressive man and he suggested Sam take up exercise for his health. Sam started on weights. His nerves got better and his health improved, and then one day, about a year later, the inevitable happened - the bug bit and Sam wanted to look like John Grimek. He came to see me about it. "Johnny," he said. "You wouldn't really say I got a good build, would you?" I thought he was kidding. I put down my book and looked at him. "Well then, frankly, Sam," I said, "no, I wouldn't." He looked embarrassed. He slid up the sleeve of his sweat shirt and showed me his arm. "You wouldn't actually call that heavily muscled, would you?" "Sam," I said. "Let's face it. You got pretty near as much muscle on that tin leg of yours." He thought about it for a moment and then wandered back into the gym and I picked up my book again. I'd been trying to finish Steinbeck's Grapes of Wrath for over a month. I read a page and then Sam came back in. "You busy, Johnny?" he said. "Sorry to bother you." 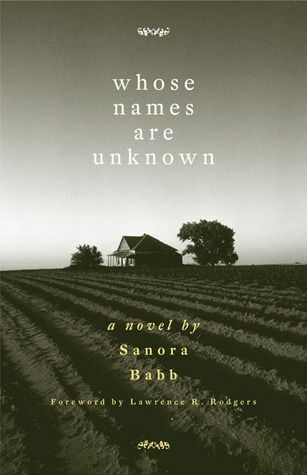 Sanora Babb's "Whose Names Are Unknown" has enjoyed an underground reputation for many years among those scholars who have known of its existence. Babb is a skillful artist who identified wholeheartedly with the ordeal of the dispossessed during the 1930s. The recovery of her novel is a miraculous gift that will play an important part in future reconsiderations of mid-century U.S. literature. I put the book down. "I'm not busy, Sam. What do you want?" He still looked embarrassed. "Johnny," he said. "What's the most important thing for a good build?" "I know. But apart from that?" He picked up the book and riffled the pages. "Weight training builds bulk, don't it?" "The how come I ain't bulky?" "Cause you're not training properly to get bulky." He looked surprised. 'I'm not?" I took the book from him before he tore it. "Because," I said, "you never told me you wanted to. When you started here you said you just wanted to calm your nerves and improve your health." I looked closely at him. "You're doing that, aren't you? Your nerves are okay. Your health's improving." "It is," he said. I can't complain." "Training should be directed towards a definite goal, you know." He left and I opened the book. - Sanora Babb wrote Whose Names are Unknown in the 1930s while working with refugee farmers in the Farm Security Administration (FSA) camps of California. Originally from the Oklahoma Panhandle herself, Babb, who had first come to Los Angeles in 1929 as a journalist, joined FSA camp administrator Tom Collins in 1938 to help the uprooted farmers. As Lawrence R. Rodgers notes in his foreword, Babb submitted the manuscript for this book to Random House for consideration in 1939. Editor Bennett Cerf planned to publish this “exceptionally fine” novel but when John Steinbeck’s The Grapes of Wrath swept the nation, Cerf explained that the market could not support two books on the subject. The book was eventually published in 2004. I'd hardly found by place when he walked in again. "Johnny," he said. "What's the best exercise for bulk?" "What's a good substitute for them?" "There isn't any substitute for them." He frowned. "You know I can't do squats." 'I know. You didn't ask me that." He looked dejected. "Sit down," I said. He slumped on a chair. I opened the desk drawer and tossed Steinbeck in. "Sam," I said. "Let's be honest with each other. Do I gather from all this pussyfooting around you're doing that you'd like to build up a showy physique?" He winced. "There's nothing wrong with that, is there?" "What about squats? I can't do them." "I know. That makes it tougher, all right." "Is there anything I can do instead?" "Not really." I thought about it for a while. "You see, Sam, squats are the number one exercise in any gaining program. Nothing can really take their place. Squats are responsible for more pounds gained than all the other exercises put together. They'll literally transform you if you work hard enough on them." He looked worried so I hurried on. "But in your case, there's no use worrying about all that. You can't do heavy squats so you've got to work hard on some other exercise - something that'll do almost as much for your upper body as squats will do for your entire body." "They'll take the place of squats?" "No," I said. "Nothing'll take the place of squats. But parallel bar dips will help a lot." "Well," I said, "normally they should be done in conjunction with squats. The combination of the two - heavy squats to stimulate overall bulk and power and parallel bar dips to localize the action and pack the chest and arms - makes a fantastically effective routine. I've know lots of men who built up real herculean size this way." "Yeah," he said, "But . . ."
"But you can't do heavy squats. I know. So we've got to forget them and concentrate exclusively on the dips. It won't be as good that way, but you can still accomplish a lot if you work hard enough." "I don't mind hard work," he said. "You might mind it as hard as I'm talking about. Not many people appreciate what hard work really means in the sense that I mean it." I thought for a moment. "Have you ever seen one of the real big boys work out? Reg Park, for example?" "No," he said. "I never did." "You should. It'd knock your eyes out. Park puts out a concentrated effort that's inspiring to watch. He jams more work into one workout than the average trainee does in a month. That's the reason he makes other guys look like old ladies with rickets." "I'll work hard," he said. "Okay. And don't forget that I'm talking about doing parallel bar dips, I mean doing them properly. You gotta use every ounce of will and vigor you can muster. Do them properly or don't do them at all, okay?" "Good." I swiveled around and got comfortable. "Now. Parallel bar dips are one of the oldest exercises of them all. "They're an offshoot of the common pushup, only a heck of a lot more result producing. They're a perfectly natural movement, they need a minimum of equipment, and it's almost impossible to hurt yourself doing them. "Parallel bar dips," I continued, "give a terrific workout to the three most impressive upper body muscle groups - the pectorals, the triceps, and the anterior deltoids. They'll bulk up those groups in short time if you work hard enough." "You don't hear much about dips," Sam said. "No," I said. "You don't hear much about dips," Sam said. "No," I said. "You don't." And here's why. Parallel bar dips used to be practiced years ago before the days of protein supplements, multiple sets, and so on. Nobody got much in the way of results from dips, but they didn't get much from the other exercises either. They were doing them all in a very old fashioned way. "Now," I said. "At about the time the new discoveries were being made in training techniques - multiple sets and so on - the bench press somehow enjoyed a wave of popularity. Everybody started bench pressing and applying the new training techniques to it. The records went up, the guys got results, everybody was happy. 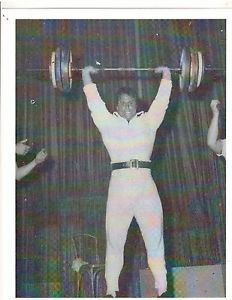 But parallel bar dips fell into limbo and the new techniques weren't applied to them except in a few isolated cases. "Incidentally," I added, "those isolated cases got results. Maurice Jones used dips twenty-five years ago and built a 52-inch chest and 19-inch arms. Park does a lot of dips and you know what he looks like." "How about me?" Sam said. "What do you recommend?" "Well," I said. "Dips are ideal for the 'High Protein/High Set system. Figure on doing 15 sets of dips." "That's a lot of sets." "Sure," I said. "And you'll get a lot of results." "You gotta work hard, though, and you gotta use heavy weights. Tie them around your waist. You gotta work up to well over 100 pounds, and you should be trying for 200." "Start out with a moderate weight for 5 reps. Then add weight and do 5 more reps. Then jump to your best weight for 3 sets of 5. Keep forcing the poundage. Add some weight every workout. You've got to grit your teeth and make it the most important thing in your life. "Now," I said. "Drop the poundage way down and start doing sets of 8 reps. Do 10 more sets with about 30 seconds rest between sets. Drop the weight slightly as you tire, but don't add to the rest period. These fast sets will give you the kind of pump you gotta have to really grow. "Don't forget the high protein part," I said. "Make your meals primarily protein. Eat three meals a day, take a snack between each meal and at bed time, drink at least two quarts of the 'Get Big Drink' and eat all the supplements you can afford. "Think you can manage all that?" I said. "He left and I took my book out of the drawer. I'd just found my place when he came back in. I closed the book. I showed him the cover. "Nice story" he said. "You oughta read it some time."